Why do we mask? Is it not fear of truth? Who is Truth? Is it not our God? So our masks really are our attempts to control goodness, to make sure we get all the goodness we think we deserve. It is the Lie/lies that form and entice the masks. We mask to achieve goodness for ourselves. We choose the mask that will ‘control’ the outcome for us. 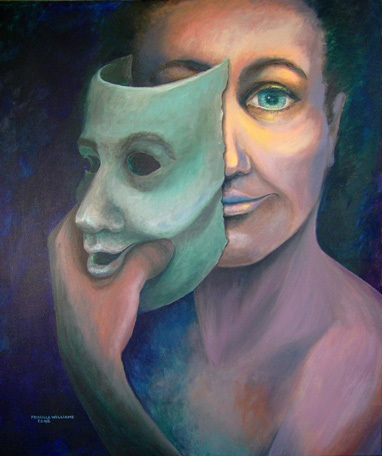 This painting is about the person (designed to be male or female and not a definitive race) just beginning to trust the truth that it is better without the mask. The one discarding the masks discovers true self, true grace and true freedom, indeed. Yes, there are risks. Those who want to stay masked may reject such notions and try to force the mask back on the one who attempts to reveal truth. Nonetheless, it is the beginning for this person. The smile (the joy of this) is beginning to break forth.